Over the holidays, I upgraded my phone from a Samsung Galaxy S4 to an S7 Edge. It’s really pretty and blue. It also came with a free Gear VR headset, which initially seemed like a trick. “Is this a replica? Do I have to give it back?” It was real though, and they let me keep it to trip out on ever since. Virtual reality is an absolute blast, even when relying on the limited dimensions of a phone screen like the Gear does. I’m not usually one to talk about immersion (I text far too much while I play games), but stepping into a virtual environment honestly feels like stepping into a different world that just happens to be a little pixel-y. Even then, those visible pixels might just be part of the Gear experience though, because a friend of ours got a hold of an HTC Vive setup and has been living in Elite: Dangerous ever since. He seems happy with his choices, and we’re happy for him. Since it’s so present on our minds though, it begs the question: has our community been grabbed by the VR sensation yet? Turns out, the answer’s a pretty solid no. A few of you said you had an HTC Vive (and just know, I’m resentful with envy), and roughly seven of you said have one of the headsets that didn’t belong to either of the “big two” of VR. 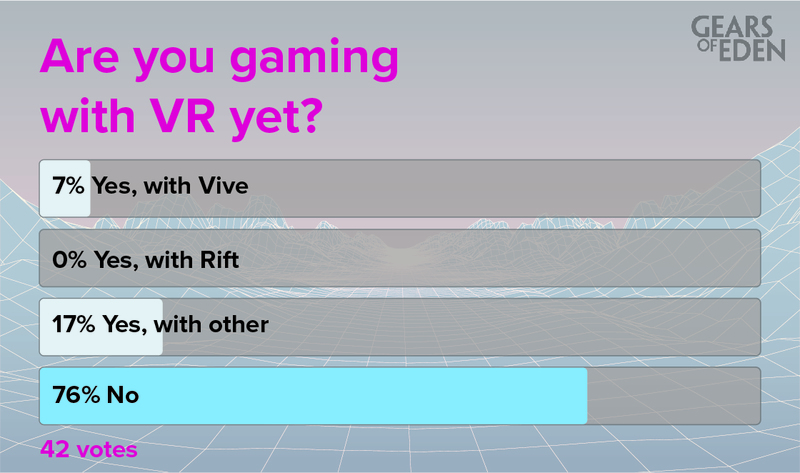 Look how many of you said you had an Oculus Rift though … that’s right. None. Now, admittedly, that’s nobody in a pool of 42 voters. I’m sure our numbers are a bit inaccurate for the larger gaming community, but that’s still very interesting. It’s also fairly easy to assume that these numbers are as low as they are because we’re dealing with gen 1 technology at an incredibly steep price, but wow! It’s hard to get past the amazing marketing that they’ve done with the Vive. There’s a great lesson to be learned here about launching a new competing product in the shadow of an assumed juggernaut. It’s worth noting that, while we’re all very excited about the developments in VR and the effect that it certainly will have on the future of gaming, we’re not planning on designing this Gears around that technology. We’d love to get there eventually, but for now the VR design landscape is something similar to the wild west: few rules, little structure, and a whole lot of discovery. That’s exciting all on it’s own, but I know I’d hate to find out we leaned too hard on some artificial design gimmickry and let the core of our gameplay experience go to waste. Again though, this technology is important, so I feel confident saying that we all want to make use of it in a future project. This week, we have another poll for you–how do you feel about indie games vs more mainstream titles? Now, I’m sure we have a bit of a bias, but we’re curious what you think, so cast your vote before you leave! Your feedback is important to us! We want to hear your opinions and thoughts. Sound off in the comments below and be sure to follow us on Twitter for updates on all things Gears of Eden. That’s it for this week’s Fan Feedback though, I hope to see you next week!